The ingredients for a classic paella. Hola paella. This is a one meal shopping list belonging to somebody who enjoys cooking and probably goes shopping often through the week rather than doing one large weekly shop. What is app?? Apples or something a bit more high tech? Last but not least, this is now the third continental contribution to TheShoppingLists.com Many thanks to Yvonne’s’ niece in Comox, British Columbia, Canada. We now have lists from the UK, Australia and Canada. Hi Yvonne, or Yvonne’s niece, could you let me know in which shop this list was used? 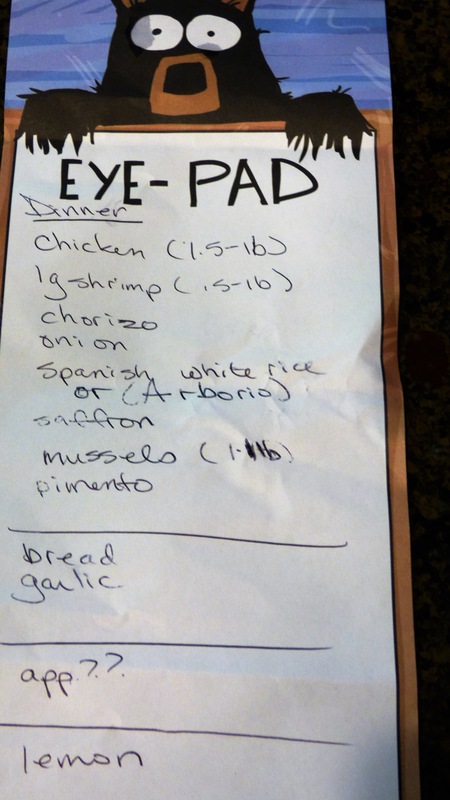 Dinner: chicken, shrimp, chorizo, onion, Spanish white rice or arborio, saffron, mussels, pimento, bread, garlic, app? ?, lemon. Am loving this blog so much! Do you think app might be consult the app with the recipe to check anything forgotten or the weights etc. I will give you a big plug at the weekend and hopefully will be able to find a few shopping lists. I have already told my friends via email- I have become quite obesessed. That will be really great. Thank you so much! We were in Vancouver last week and a good friend made paella for us. I am going to attempt making it for unsuspecting guests. The ingredients came from a variety of shops. I figured that living in a smallish town would make it difficult to find quality saffron (a must according to the recipe). Found it at the first store I went to! Woot!!! This is so much fun. I hope that many others take the plunge and send you their shopping lists. I hope Alida tells us what “app” is/are. Maybe apples??? I’m nagging at her to let you know what she meant by “app”. She had to go to yoga, so should be in touch after that. If not, I’ll crack the whip again. She should be a guest blogger, she’s very funny. Here’s one of mine where she gave me a lot of “help”. Yes, very good. Poor cat. I would be very happy if she could contribute in any way. Guest blogger status granted should she wish it! She won’t, she’s a tad shy! OK, she’s back from her body maintenance (aka Yoga), and the mystery apps is for appetizers, she couldn’t decide what to make. She gives me an inferiority complex, I’m hard pressed to serve a decent main course, let alone appetizers!